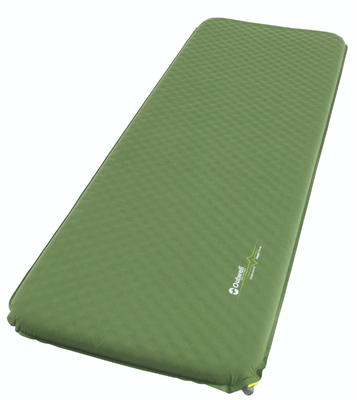 The Outwell Dreamcatcher range of self-inﬂating mats covers all bases for campers seeking reliable sleep comfort in lightweight packages. From single styles in a variety of thicknesses (7.5 cm-12 cm), length and width, including an XXL model, to double in 10cm . All beneﬁt from Air Flow Control Valve innovation. Options available reﬂect the varying weight and packed volume requirements along the camping style spectrum. The Outwell Air Flow Control Valve (AFC) was created to enhance performance and convenience by addressing the way we inﬂate, adjust and deﬂate a self-inﬂating mat. It overcomes age-old problems by delivering faster and easier inﬂation, deﬂation and ﬁne-tuning ﬁrmness to suit individual preferences. Flexible and eﬀortless operation is achieved through its simple inﬂate, deﬂate and air tight positions. Durable and reliable, it incorporates a mesh ﬁlter to protect its internal components from contamination. The highly eﬃcient AFC valve is a clean and ingenious Outwell solution that marks another major innovation in their long history of leading the ﬁeld.